You’re getting married – congratulations! The hard part is over. You’ve found the man who you want to spend the rest of your life with. The easy part is making him look worthy for your big day. With Jos. A. Bank men’s apparel, this is a piece of cake. Whether you’re having a laid-back and beautiful wedding on the beach or a formal affair with all the trimmings, you can find exactly what your man needs with Jos. A. Bank. For instance, a beautiful formal church wedding may demand the Manhattan Tuxedo Style 930, complete with a slim silhouette and classic notch lapel. This very classy tuxedo can be dressed up with vests and ties that complement your wedding colors. Just imagine how beautiful those wedding photos are going to be! If you’re going for a more casual day, like a garden wedding or a beachside affair, you may want to go with the Medium Gray Aspen Style 322. This stunning tuxedo is casual, but it exudes charm and luxury. 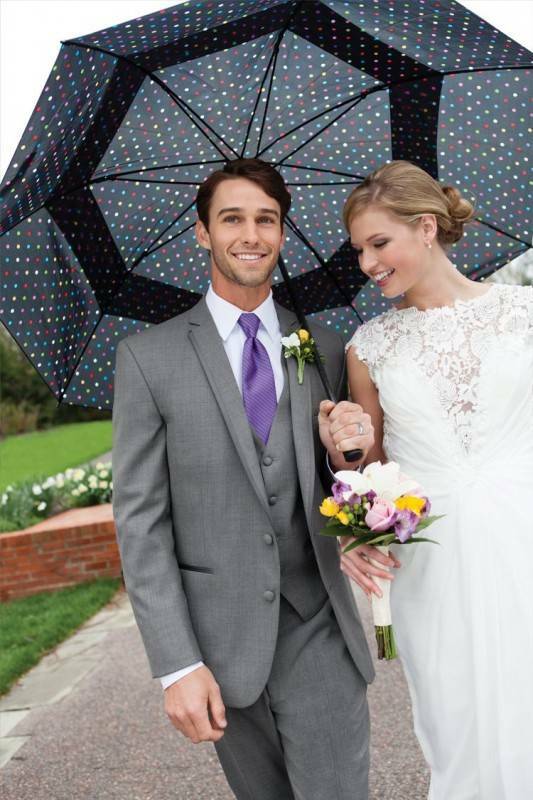 You can bet your groom will look absolutely gorgeous next to you in your breathtaking gown. You can also choose from slate blue or tan; whichever suits your wedding theme and colors best. You can also try the new Slate Blue Aspen Style 382. It’s a great way to add color to your formal wear! Want to go even more casual that that? Consider going jacketless! They even offer a jacketless package in six different color choices – black, tan, slate blue, and three shades of grey. 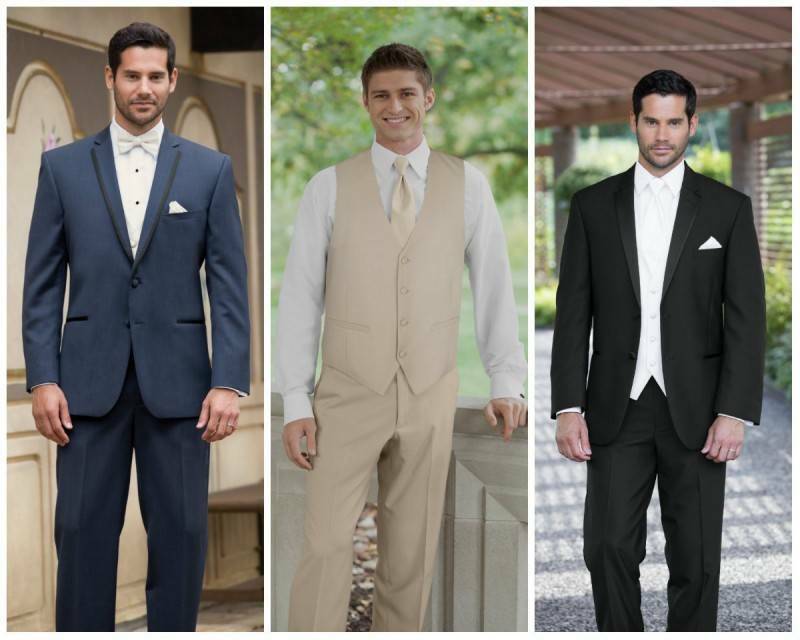 Once you’ve chosen the perfect tuxedo, it’s time to make sure your groom is color-coordinated. Jos. A. Bank offers up hundreds of tie, vest and cummerbund colors so it’s super easy. When you’ve found the perfect color, you can make things match even better with particular shades and patterns. After all, purple isn’t just purple – it’s lavender, rum raisin, purple storm, violet, grape, eggplant, freesia, wisteria, and on and on. By the way, Jos. A. Bank offers all these colors and more. Visit their color finder to locate the perfect color for your groom’s accessories. Just like the bride must have the perfect bridal jewelry, the groom must have the perfect accessories. Jos. A. Bank offers up pocket squares, cufflinks and studs, as well as shoes. Maybe your wedding calls for the stunning black and gold cufflinks or perhaps you want to up the style factor with the Cooper Ferrari Red pocket square. Whatever your groom needs to set off his look, Jos. A. Bank has it. Take the time to browse through their massive collection or go straight to the color finder and locate precisely what you need for your amazing wedding day. You’re going to love everything Jos. A. Bank has to offer.